NEED PARTY BUS OR LIMOusine HIRE? Book 16 to 35 seat Party Bus Hire with Funky Limos or 13 Seat Stretched Limousine Hire for your special day or weekend away. Covering Sheffield, Rotherham, Chesterfield, Doncaster, Leeds, York, Manchester, Derby, Nottingham and surrounding areas. We typically deal with groups of 10 to 35 passengers onboard our party buses and stretched limousine, however we can now cater for up to 137 passengers simultaneously in a 6 vehicle party bus/limo convoy for big wedding parties. Be it a return journey to another town or city or a local one or two hour party bus tour we can find a package to suit your group with party bus prices starting from just £17.50 per head. 13 Seat Supersize American Stretched Limo from just £20 per passenger. If you would like a quote for Limousine hire then get in contact today and speak with one of our sales professionals. We are the professionals when it comes to limo hire, boasting the experience to provide faultless transport. At funkylimos.com we take pride in our approach to pricing, giving visitors an array of competitive party bus hire options. 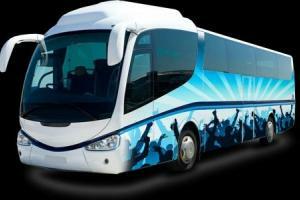 We at funkylimos.com are the UK’s most trusted party bus supplier, renowned for our reliability. We have proven to be very flexible, With such a wide range of vehicles. We offer around the clock assistance, helping people plan party bus & limousine hire with ease. New Special Offer: 1 Hour Packages starting from £17.50 per passenger Call or request a quotation for more info. Local prices starting from £20 per passenger based on paying for at least x20 passengers, maximum occupancy x22 passengers. Local prices starting from £20 per passenger based on paying for at least x25 passengers, maximum occupancy x35 passengers. We can offer competitive rates for luxury Airport Transfers catering on our 16 seater, 22 seater and 35 seater party busses. Funky Limos is a long standing member of the 'National Limo Association' and operates on a 'Standard National Operators License' which is governed by VOSA. All of our Limo Coaches have undergone an extensive VTP5 examination with VOSA to ensure that they are fit for purpose before being put into service.